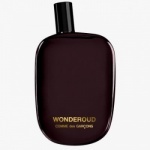 Comme des Garcons Wonderwood is a new and enticing fragrance. Comme des Garcons Wonderwood has been created as an evocation of exuberance. 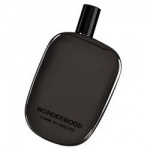 Comme des Garcons Wonderwood is a new and enticing fragrance. Comme des Garcons Wonderwood has been created as an evocation of exuberance. Comme des Garcons Wonderwood is a positive overdose of woods, woody notes and synthetic wood construction. Comme des Garcons Wonderwood features vetiver, sandalwood, patchouli, Guaiac wood, Virginia cedar, agarwood (oud) javanol, cashmeran, pachiminol and cypress, for a warm, tart and provocative fragrance. To mark the launch of Comme des Garcons Wonderwood, a short film has been made by the Brothers Quay, highly renowned for their stop motion technique of film making. The piece, entitled Comme des Garcons Wonderwood, is about a man who loved trees more than words could say. An allegorical representation of non verbal passion, the film expresses through visual rapture the beautiful exorbitance of this new Comme des Garçons fragrance. Comme des Garcons Wonderwood is a positive overdose of woods, woody notes and synthetic wood construction.